- High quality universal sports wristband for all 4.0’’ - 6.5’’ cell phones. - Unique net surface back pad helps to absorb sweat, increasing sports comfort. - Designed considerately and exquisitely with 360 degree rotation. 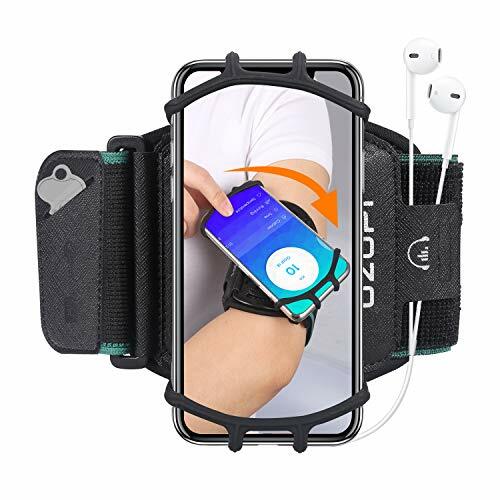 - Carry and use your phone during exercise, totally free your hands. - Highly elastic and adjustable velcro strap fit for most different size of arms. - Ideal for Fitness,Gym Workouts, Walking, Jogging, Running, Hiking, Climbing, Cycling, Camping, Marathon, Cleaning house etc. - Adjustable band and double highly elastic fastener to enjoy a comfortable wear,easily fits any arm size from women small arm 9 inch to man large arm 16 inches. Fit for Arm Girth: Approx. 26-41CM/ 9"-16"